Week 5 saw no relief from this season's torrent of passing yards. 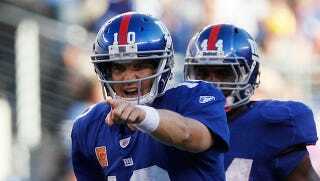 Eli Manning and Matt Schaub each threw for more than 400 yards in losing efforts. In fact, seven of the 10 400-yard passing games this season have come in losses. A losing quarterback, forced to throw as part of a futile comeback effort, often throws for more yardage than the winner, which tells us something about using total passing yards as a measure of effective offense. Nevertheless, passing yardage is sky high in 2011, and the rapid increase begs for an explanation. Through Monday night, teams have averaged 246 passing yards per game compared to 222 in 2010. On my website, Advanced NFL Stats, I looked at all the common measures of passing: total yards, completion percentage, yards per reception, and attempts, as well as some more sophisticated metrics. Some of the numbers are surprising. One of the most reliable gauges of passing ability is net yards per attempt, which takes into account sack yardage. For most of the past decade, YPA hovered between 6.2 and 6.5, but so far this season it's close to 7.0. In 2007, Peyton Manning was third in the league with 7.0 YPA. Now that's the average. Completion percentage is unchanged from last season at 61 percent. In order to account for that yardage increase, quarterbacks must be getting more bang for the buck. Indeed, yards per reception have swelled from 10.8 last season to 11.4 this season. That's a big jump when put into a broader context. Just like YPA, YPR has been relatively steady over the past decade, never exceeding 10.9 until this year. You might guess that offenses are passing deeper this year. That would explain how completion percentage has stayed the same while YPA and YPR are way up. But that's not the case. The percentage of deep pass attempts, defined by the NFL as anything over 15 yards, is curiously declining. Deep pass percentage is now below 19 percent for the first time since the league started tracking pass depth in 2006. Last season it was 19.5 percent. One theory I heard recently to explain this year's passing numbers is that defenses have embraced the bend-but-don't-break approach. But that's just not the case. Sacks and interceptions are slightly down, following a decade-long trend, while offensive scoring is slightly higher. There's been both more bending and more breaking this season, and defenses are making fewer big plays. I also keep seeing articles and hearing TV guys claim that the lockout is the cause—that missing practices this summer has hampered defenses more than offenses. This is an easy, lazy conjecture, impossible to prove and impossible to reject. If passing were dramatically down this season, the very same analysts would be telling us that the lack of off-season practice disproportionately affected the delicate timing of complex passing offenses. If field goal percentage were down, they'd say the same thing about kickers and holders, too. What's with the rise in YAC? My theory is that it has to do with the rise of the screen pass. (See Chris Brown's piece in Grantland on "the rise of the space player.") High YAC numbers usually come from screens and check downs. I believe we're seeing more and more screens, particularly wide-receiver screens where one wideout runs a "pick" pattern. This is ostensibly illegal, but allowed when the pick is a natural result of a receiver's planned pattern. Screens of all types are primarily intended to counter the pass rush. Offenses are adapting to more aggressive and confusing pass rushing with quick, short passes, designed to get quick receivers in the open field. It's not much different than the tactics Bill Walsh first employed in the late 1960s and early 1970s under Paul Brown in Cincinnati, with short passes replacing a woeful running game. One of my readers also suggested that the new kickoff rules have something to do with the passing boom. The rise in touchbacks means that offenses are starting closer to their own goal line, providing a longer field and more room to accrue passing yards (at least on initial possessions after each kickoff). This seems plausible if you consider that many long breakaway plays would go for 200 yards if the field were long enough. If you're waiting to see these passing numbers regress to the mean as the season goes on, don't hold your breath. This season is part of a long-term trend in passing in the NFL. The ridiculous yardage totals may regress to some degree, but the true mean of today's NFL is not necessarily last season's numbers or an average of the last several seasons. The game continues to change. Brian Burke is a former Navy fighter pilot and the founder of the website Advanced NFL Stats. He is a regular contributor at the New York Times's Fifth Down and the Washington Post's The Insider.